Little Pixy Boots' Blog: Illustration Friday - Hurry! Life is full of ups and downs and recently I've been on a constant roller-coaster ride. I'm not just saying it, but living it. Anyway, that explains my lack of posts recently, but I'm trying to get back into it slowly, bit by bit. As Star Trek - Deep Space 9, episode 1 says, our human lives are in a linear time-space, and we shouldn't live in the past. Paraphrasing it a little, but that's what I've learnt. 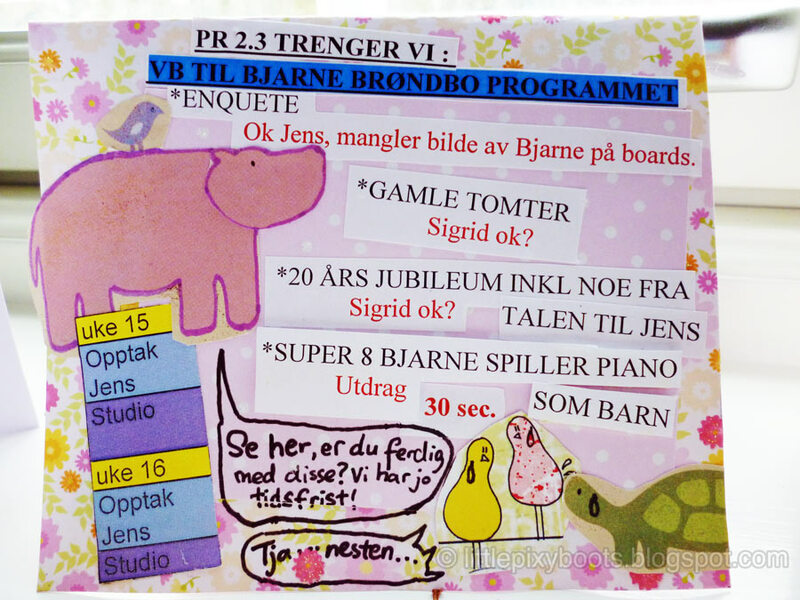 Before the whole fire accident that burnt down my garage, I had made a set of pretty cards for the «Litt av et liv» (What a Life!) team I worked with in NRK (Norwegian Broadcasting Corporation) and some of my colleagues were from Nordisk Film TV. For some strange reason, my thoughts run in the Norwegian language now and I'm tempted to write in Norwegian, but shall not embarrass myself on cyberspace. Translating this card already puts me in the high-risk category. VB or VT is TV-production jargon for video inserts we show in between interviews or segments of the show, to illustrate a point, background or emphasis about the topic at hand. I believe the term comes from the old analogue video tapes TV or broadcast stations used to use to playback such segments (don't quote me on that). Even though we have moved on to the digital HD age, old names remain stuck. 3. 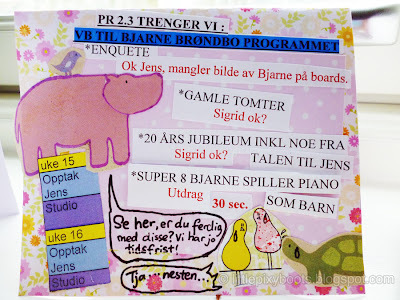 *Gamle Tomter (lit. "old grounds" or "land") - referring to the celebrity guest's background, childhood and past - Sigrid ok? Jens Stoltenberg is the Prime Minister of Norway, as of 2012. Some Americans say he looks like James Bond on «Alt for Norge» (a popular TVNorge show named "Everything for Norway"). The 20th Anniversary refers to 2012 being the 20th year of Bjarne Brøndbo's band, DDE's establishment in Norway. Maybe I'm enjoying too much of the translating. Look here, are you finished with these? We have deadlines, y'know! Hope you've enjoyed picking up some Norwegian (or Norsk)! In the meantime, I shall continue to scour around for used sofabeds on Finn.no.